Drive-Master has been in business since 1952 and is one of the oldest family owned and operated adaptive mobility equipment dealers in the United States. 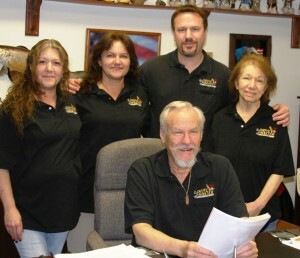 Our staff has over 3 generations and 280 years of combined experience. Drive-Master is your total mobility center. Drive-Master was founded in 1952 by Alan B. Ruprecht after he had become seriously disabled from adult Polio. He soon realized that there was little he could do without the freedom of driving his automobile. Unfortunately, the hand controls available at the time were too costly and poorly constructed. Using his engineering background and vast experience with cars and metals, he designed the Drive-Master Push-Pull Hand Control System to operate the gas and the brake by hand. That was just the beginning. Over the years Alan, along with his family, created many different types of adaptive vehicle modifications that are available today. The Drive-Master Hand Control, along with other Drive-Master equipment, has been installed and utilized by thousands of people all over the world. Today, Drive-Master is run by Peter B. Ruprecht, Alan’s oldest son, and Peter’s wife Adrienne, along with their children Tina, Peter Jr. (P.J.) and Cheryl. Drive-Master offers many different types of adaptive equipment and has dealers located throughout the USA and across the globe. Drive-Master also sells and services a full line of wheelchair accessible mini vans, full size lowered floor van conversions, EMC driving equipment, hand and foot controls, wheelchair and scooter lifts.